Below is a screenshot of what it would have looked like before inverting the picture. There are still addition/difference modes (with "legacy" versions if you want the exact behavior of 2.8). What is that "guide string"? Quote: ..I can keep going in a circular motion drawing from the center of a circle for instance to the outer edge one stroke after another in rapid succession (it used to make some pretty interesting designs) until I had enough contrast to where it was almost black.. This is the bit I can not understand. A solid gradient such as brushed aluminium will replace anything that was previously drawn. Without more information I can get 'something' like your design with multiple layers in 'some' layer mode. Need more information on your work flow. Have you tried the button 'Instant mode' at the bottom of the gradient dialog? With that checked, the behaviour is 'legacy', i.e,. gradient at once. Guessing that 'guide-string' are the gradient control points. Very useful for modifying a gradient on the fly without going into the gradient editor. As carmen pointed out you can lose that in instant mode. Hold the shift key down. All on one layer. 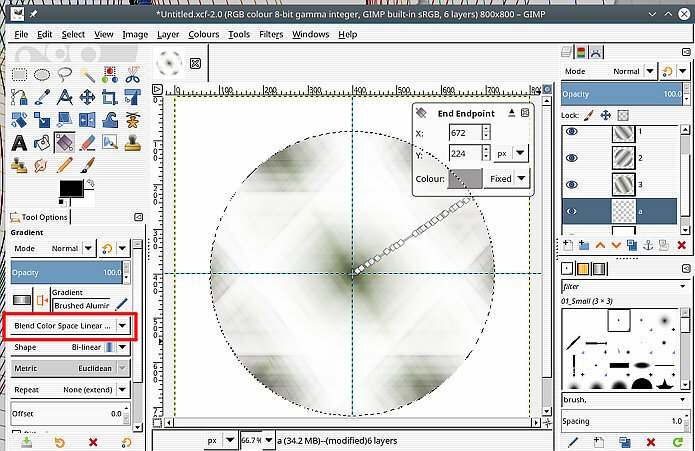 Yes the gradient tool options mode and legacy mode (for gimp 2.8 type) will build up a design on one layer. thank you guys I a about to fiddle around with it again and see if I can change the settings. and yes I was talking about the Gradient Control Points, just did not know what it was called. Sorry for the confusion, Carmen you hit it right on the nose, Thanks you. rich2005 Thanks you for that picture, I am a visual person so that was super helpful along with your detailed explanation, I finally got it figured out. To achieve the results I was looking for, was setting it to difference with Instant Mode enabled. Thank you for the fast help I figured there had to be some way to get this to work. I just have to remember to enable that before I start drawing or the or instant mode will no longer be accessible for some reason. This is what the final result was. Edit, one thing I may want to point out, the (Shift) next to the Instant Mode is misleading, because I did play with all the options but I hit the Shift key and that made Instant mode unavailable, leading to frustration. So Thanks again for the help. (11-07-2018, 12:41 AM)CSCreations Wrote: I used to use the Gradient tool mostly Brushed aluminum, to make a diamond texture the easy way, with the help of a tutorial I had found. Can you give us a link to the tutorial, please ?! I'd like to see it. use the circle select or any shape you want to use in the case above I used a tear shape. start from the center ( or near center for more realistic diamond) of the circle drawing to the right x axis than again from the center to the bottom right corner, than center to bottom Y axis all the way around until you get something like this. if you like the way it looks in this case mostly a dark shape ( sometimes i make several rotations in not so uniform ways to get a unique pattern) click on Color - invert. then play around with the rest of the color settings I used this time Shadow and Highlights and you get something like this. you can variate and make it yours you can even colorize it to make it rubies and sapphires. the options are endless. This was just a quick way of showing how it was done. Hope this helps. Thanks for making the tutorial. Actually i just wanted to see the tutorial, because i couldnt find one with a search. Never heard of IMVU before. (11-09-2018, 12:26 AM)Espermaschine Wrote: Thanks for making the tutorial. LOL ( so am I ) IMVU is similar to second life, except it was there first, Lots of great creators and developers on there, so we have forums for the different programs we use to make the Items ( clothing, furniture rooms poses etc. ) for our shops. Since we have to make all our own textures ( because of copyright laws) some of the original members have posted some great tutorials in the IMVU Groups. I am part of a Gimp group that is unfortunately no longer active. Years ago I had saved the tutorial so I could reference it easier. This is my Shop every texture for each Item was made in Gimp with the help of amazing plug-ins such as G'mic and a few others from the Gimp plug-ins page. The Gradient tool is the most used tool when it comes to make a flat texture look realistic and 3 dimensional, if it is for making the Diamond or to make the setting for the jewel or adding some shine to a wall or frame. Knowing how to make things realistic and high quality with the right lighting is key. I even made a realistic Kachelofen mesh in sketchup than used Gimp to make the textures and Opacity maps for the whole thing. 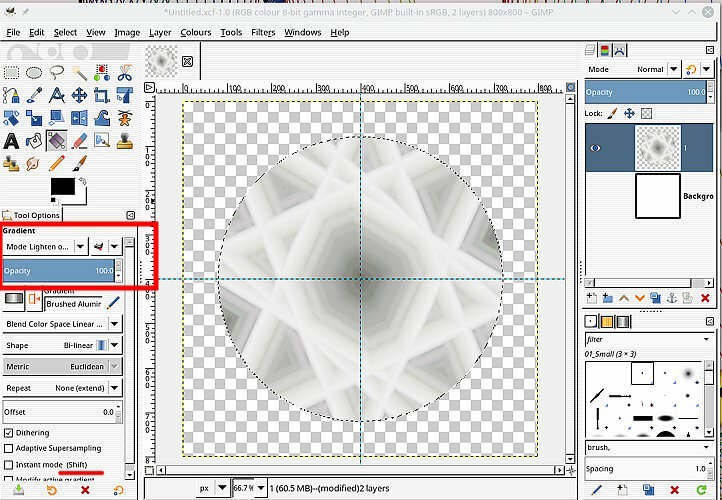 I may just rewrite the tutorial with better pictures and step by step walk through for making a realistic Diamond texture for the newest version of Gimp and share it on the Gimp home page. Thanks for giving me that Idea.